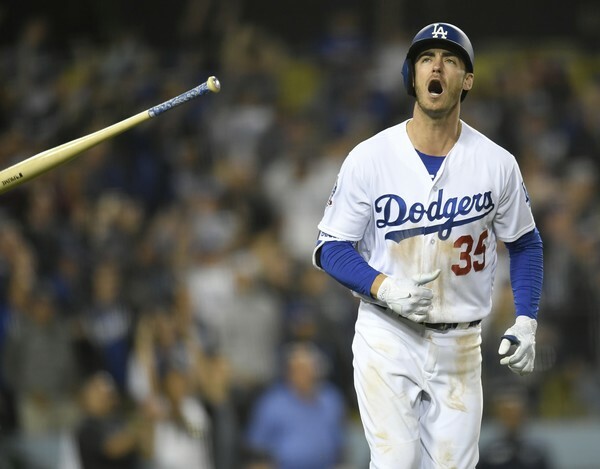 Cody Bellinger woke up the sleepy Friday night crowd at Dodger Stadium with his second home run of the season. The Dodgers battled back from a 7-2 deficit to lose 8-7. In the end they just came up a big hit short. Maeda was really poor in his outing. His third inning that allowed four runs to cross the plate included walking his opposing starting pitcher Zach Greinke, and two wild pitches. He was removed without escaping the third, putting added stress on the bullpen. Tony Cingrani gave up a big two run home run to Daniel Descalso; a guy he’s paid to get out. The Dodgers move to 4-8 on the season. They have now lost their last 10 regular season games against Arizona. Arizona absolutely owns them, in every way imaginable. When you think back to the NLDS sweep in 2017 – that’s why it was so surprising. Arizona absolutely has the Dodgers number. I thought the Dodgers were meant to come back and win this one. It just had a weird feel to it. I never thought they were truly out of the game. When Chase Utley hit a room service ground ball and it kicked off the second base bag to score two runners; I was certain they were going to come back and win. But it wasn’t meant to be. Chris Taylor hit into a double play with runners on – something that was an unlikely event as anything. Cody Bellinger looked awesome in this game. He homered, nearly homered a second time that would have won the Dodgers the game, and singled twice. He tallied hits off Greinke and DBacks closer Brad Boxberger, who seemed to find his velocity again. In a game where it was hard to find a Dodgers’ standout, Bellinger was the easy pick. ← Previous Story Dodgers Lose in Arizona in 15, I am a Zombie.